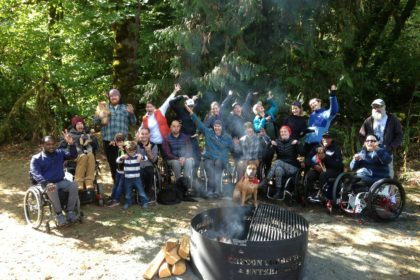 Summer is the season for the outdoors and camping, and yet people living with disabilities are less likely to go camping and enjoy the great Oregon outdoors because of diverse environmental barriers. 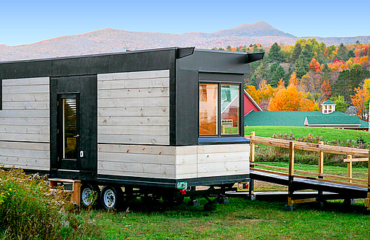 Specifically, the majority of Oregon’s camping facilities and outdoor recreation programs are not designed to accommodate people with disabilities. This is an example of how systemic barriers can contribute to the social isolation and poor health among the disability community. 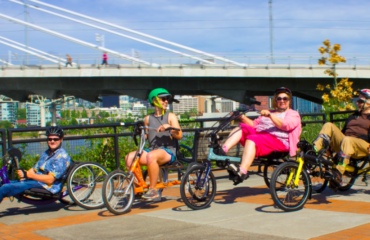 Many of the 950,000 Oregonians with disabilities encounter substantial and persistent barriers to participating in health promoting activities, and public health data (BRFSS) indicates that Oregonians with disabilities are at a greater risk of developing chronic and secondary conditions. Some of this risk is due to systemic barriers they face to engaging in healthy activities. A team of partners and sponsors teamed up to change this and make Oregon State parks more accessible. 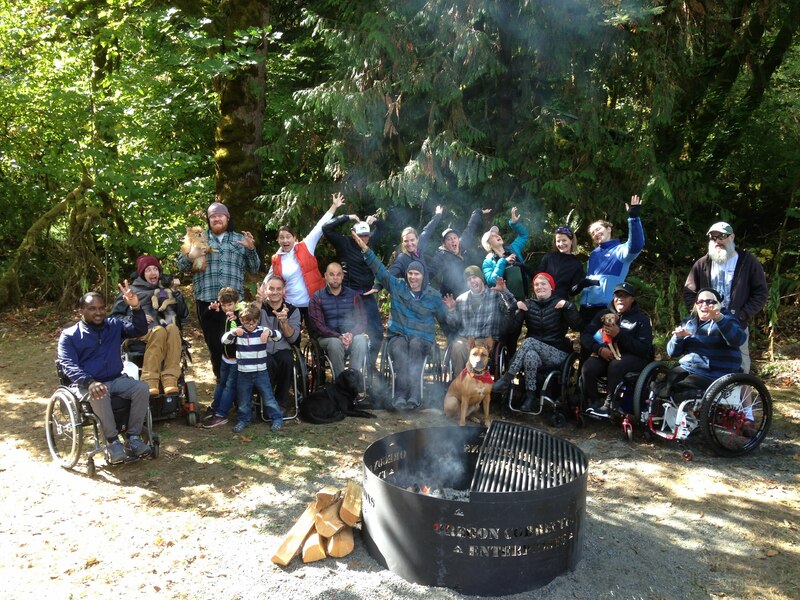 Oregon Spinal Cord Injury Connection, Adventures Without Limits and Oregon State Parks Department convened to develop an event that would showcase the outdoor enthusiasm that is alive-and-well in the disability community, and the barriers they face to enjoying state parks. 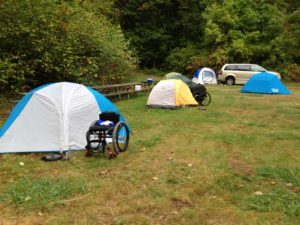 With the help of Health and Outdoor Initiative and the Oregon Office on Disability and Health at OHSU and generous sponsorship support from Oregon State Park Foundation and Health Share of Oregon, the team hosted an “adaptive” camping event at Milo McIver Park, September 22-23rd. Ten members of the Oregon SCI community, their families and partners participated and agreed to be filmed throughout the weekend. On most camping trips you wouldn’t have someone in the background filming, but we filmed aspects of the weekend in order to produce an educational video to influence policy recommendations, State Parks’ budgets and future legislation to increase funding to improve access and accessible programing to Oregon State parks. Keep an eye peeled for the video! We want to thank all our partners and sponsors for making this event, the forthcoming video, and the systemic change we hope to effectuate, possible. Oregon State Parks Foundation gave a generous donation of $5000 and Health Share of Oregon generously donated $1000. These funds offset participant costs and paid trained adaptive recreation technicians to support the weekend. Adventures Without Limits managed all the logistical support and volunteers, including setting up and tearing down camp, hosting the adaptive kayaking trip, providing camping equipment, and cooking our delicious meals. Oregon State Parks and the Milo McIver park rangers transformed a group site to be maximally accessible by leveling surfaces, installing a powerchair charging station, purchasing and installing a mat table in the rest rooms, removing the benches from several picnic tables to make them wheelchair accessible, and installing an amazing fire pit. The Health and Outdoors Initiative managed all the photography, filming, and interviewing and will be producing the video. Oregon SCI convened the partners, secured funding, recruited participants and managed communications.